Do you have skill that few have mastered, but many envy? The ability to get a ping pong ball into a small cup can be a frustrating task. For those who have the talent, they will succeed in a game of PongCano. 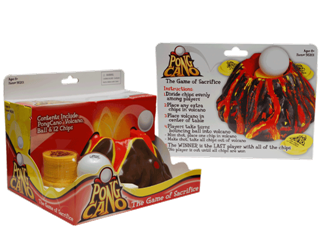 PongCano has a simple premise; players want to get the ball into the volcano. Sounds easy right? Every time you miss your shot, the player must sacrifice a coin to the volcano. The player to make his shot captures all the coins in the volcano. The player with the most coins wins the game. My boys really like this game. Through trial and error, we have found that this game works best on a large, flat table or on a hardwood floor. You need a surface where you can bounce the ping pong ball. There is a learning curve to the game. Once you have mastered the skill, you can make it harder. The boys have even set up games where the ball has to bounce off a wall before getting in the volcano. PongCano retails for approximately $13.99. The game is recommended for ages 8 and up. It can be purchased online or at selected retailers. Are you ready to take the PongCano challenge? Disclosure: I received this gift to review. All opinions are my own. Love this! I think my boys would enjoy it as well. That seriously looks like a lot of fun. never heard of it, but I'm sure my family will love it. Looks like fun. I'm surprised I haven't seen this yet.